Tell us, where do you live and where are you from? Is that where you produce your videos? I live near Portland, Oregon. I’m a short drive away from my production studio, Uberstock, which is located in Oregon City. You have been involved with video and animation for quite a while. What got you started producing video for sale via stock agencies? On a whim in early 2007, I decided to upload some footage to iStockphoto.com as a video contributor. I didn’t know what to expect, but I figured I had nothing to lose. I didn’t even begin to think that just five short years later I would go from making $58 in the month of April 2007 to more than $35,500 in earnings in April 2014. You are an author of a very successful book, Stock Footage Millionaire, which is about producing video footage for stock and you’ve given talks on the subject. Most successful producers do not go to such lengths to document their knowledge and share it. What motivates you? Part of what motivates me is to create opportunities for others. I’ve had, and continue to have, several amazing mentors who have guided me through the many facets of starting, building, running and maintaining my own business. Giving back by explaining what I’ve learned and showing others how to do it is a small part of how I can make the path a little easier for those who come after me. Do you travel for your productions? If yes, why? And if not, why? Yes, I do travel for my productions because I like to shoot while on vacation and my girls like being a part of my shoots, so it becomes a fun family activity. If you do travel: travelling for a production involves quite a lot of effort and cost. What steps do you take to make sure you minimize your risk of losing money (i.e. spend too much on it and get too little in return). With vacation shoots, I make sure I have a good time. I do allocate two and a half days of shooting time during my vacation. I spend one day in pre-production – so location scouting, shot list preparation and the shooting schedule. Sometimes I meet with talent, if I hire local talent. Then I will spend a day shooting and then spend a half-day collecting all the footing, backing it up and reviewing it. Drone footage seems to be an exciting area. Some see it as a new technology which will open new markets and create additional revenue, similar to when the first digital SLRs came out. What are your thoughts on drone footage? Do you use such technologies? My thinking on drones is that a drone is a tool. Drones are not going to fundamentally change what we shoot, but as a tool, a drone is something that we can shoot different types of footage of the subjects that we’re good at shooting – like if we were using a jib or a gimble or a dolly. For us, it’s just another tool. We’re not shooting specifically because we have a drone. We’re shooting different types of footing utilizing the drone. Thank you for video. What inspired you to take film it? We shot this high-speed, 4K with a RED Epic. It’s my middle daughter running to my wife, Dana, along the beach in Hawaii. It was fun. One, my daughter and I were both having a good time. Two, I had a strong hunch that it would be footage that would probably sell. Three, it was relatively easy because we were already on vacation, she’s my daughter, and I already had the camera. What does this footage’s revenue chart tell you? It tells me that it’s a pretty steady performer. It’s lifestyle footage of a little girl having fun on a beach. It’s timeless, it will never spike really high, but I anticipate it should sell fairly consistently for quite some time. 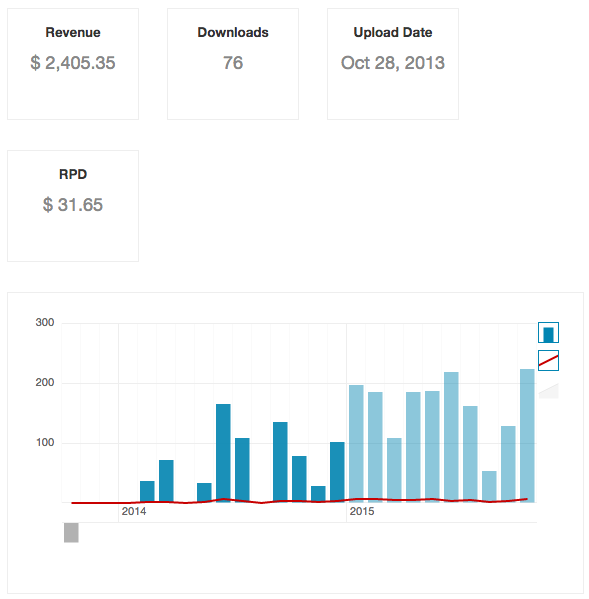 I’m very happy with the revenue chart. This is the best performing clip of the beach shoot I did with my daughters, so I’m really happy other people are enjoying the family moment I captured. We know that while the market is growing, the number of contributors is growing even more. We know there is more competition. So, as more competition comes along, we focus more tightly on what we’re good at. Rather than trying to film everything, we focus on a few categories where we know there is interest and that we know we film well. We focus on what we do best, but we figure out ways to shoot more content that’s similar to what’s selling well. Do you believe in “quantity” or “quality”? What is most important for you and why? It’s some of both. For us, the expense of producing a clip isn’t just money, it’s time. Per clip, we spend a lot of time because of the process we go through of editing, color grading and de-noising. While we always have targets for the amount of clips we want to process and upload, we want to make sure the footage we upload is high quality. Otherwise, we’re wasting our time and our time is more valuable. Quality is more important than quantity, but we still want to hit targets to keep our library growing. At Uberstock, we spend a lot of time in pre-production understanding what we want to do, creating a shot list and deciding on the style frames of what we’re going to shoot. I go into much more detail about my process in my book, Stock Footage Millionaire. But it’s the attention to detail in pre-production that helps make some of the magic sauce that sets Uberstock apart from other production companies. After that, we tend to do two kinds of a shoots – a relatively simple shoot with two or three people (cameraperson, director, and assistant) or we do a really big shoot where we have a crew of ten people. Those are the shoots we’re spending a lot of money on, with the anticipation that they will sell really well over the course of years, for instance football or business shoots. Would you recommend videographers to take risks and invest in employees or assistants, or outsource, to help them in their production process? Depends on your model. Lower-risk is to outsource as needed. But if you want to go all-in, it’s probably not a bad idea to have some employees. That’s a lot higher-risk. There’s no guarantee on that return. It also takes a long time to get a return on your investment – especially now with so much competition. Where do you think the stock footage business is going? How do you see the next years? More and more competition. 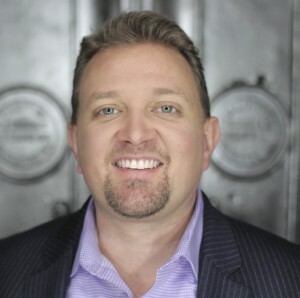 It’s definitely harder to make significant income and I think the people who succeed will have very focused, specialized niches that they shoot, and they will either leverage experience or resources that only they have to gain an advantage in those niches. What is your advice to remain a successful stock videographer in upcoming years? Focus on a niche, stick with what you do best, and be willing to stay the course. It takes a long time to get a return on your investment, but once you get it going, it can be a nice stream of cash flow. I have my three girls. I live on a small gentleman’s farm, so I have chickens and an orchard. I also like to golf.